Nose: Ginger, fresh fruits, toffee with hint of clove, nutmeg, polished oak. Palate: A burst of spice & fruit coat the mouth, leaving a subtle note of charred oak to linger. Finish: Good length, soft and very slightly smokyStrength: 42.8% ABV. 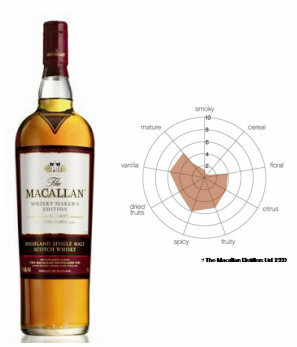 Cask Combination: Subtle interplay between the rich sweetness of sherry seasoned oak casks and the elegant fresh fruit notes of the American bourbon seasoned casks. Containing rare whisky distilled from barley grown on The Macallan’s Estate which brings a velvety mouthfeel, Whisky Maker’s Edition recognises the skill and dedication of The Macallan’s Whisky Maker, Bob Dalgarno. Bottled at Bob’s preferred strength of 42.8%, this has an intensity and robustness of flavour. Jim Murray - Sophisticated…. a must for lovers of the driest of dry martinis. An assortment of ultra-lightly peated notes peeking out from a chalky grapiness. It’s oak all the way with a layering of cocoa powder. Paul Pacult - Entry taste showcases keen baking spices, in particular, nutmeg, as well as dried fruits, like prunes, raisins, and figs; midpalate stage is especially seductive for its tightly-knit flavor profile in which all the facets, the resiny oak, the acids, the dried fruits, the nuttiness, and the oiliness work in harmony. Concludes semisweet, coconut-like, biscuity, and stunningly sophisticated. Remarkable, admirable integration.